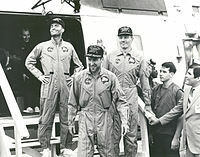 Deke Slayton, NASA's Director of Flight Crew Operations, never intended to rotate Cooper and Eisele to another mission, as both were out of favor with NASA management for various reasons (Cooper for his lax attitude towards training, and Eisele for incidents aboard Apollo 7 and an extra-marital affair). He assigned them to the backup crew simply because of a lack of flight-qualified manpower in the Astronaut Office at the time the assignment needed to be made. Slayton felt Cooper had no more than a very small chance of receiving the Apollo 13 command, if he did an outstanding job with the assignment, which he did not. Despite Eisele's issues with management, Slayton always intended to assign him to a future Apollo Applications Program mission rather than a lunar mission, but this program was eventually cut down to only the Skylab component. Ken Mattingly was originally intended as the Command Module Pilot. Seven days before launch, the backup lunar module pilot, Charlie Duke, contracted rubella from one of his children. This exposed both the prime and backup crews, who trained together. Mattingly was found to be the only one of the other five who had not had rubella as a child and thus was not immune. Three days before launch, at the insistence of the Flight Surgeon, Swigert was moved to the prime crew. Gerry Griffin – Gold team. The astronauts' mission insignia was sculpted as a medallion depicting Steeds of Apollo by Lumen Martin Winter and was struck by the Franklin Mint. The mission was launched at the planned time, 02:13:00 PM EST (19:13:00 UTC) on April 11. An anomaly occurred when the second-stage, center (inboard) engine shut down about two minutes early. The four outboard engines and the third-stage engine burned longer to compensate, and the vehicle achieved very close to the planned circular 100 nautical miles (190 km) parking orbit, followed by a normal translunar injection about two hours later. The engine shutdown was determined to be caused by severe pogo oscillations measured at a strength of 68 g and a frequency of 16 hertz, flexing the thrust frame by 3 inches (76 mm). The vehicle's guidance system shut the engine down in response to sensed thrust chamber pressure fluctuations. 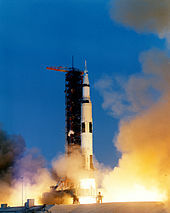 Pogo oscillations had been seen on previous Titan rockets, and also on the Saturn V during Apollo 6, but on Apollo 13, they were amplified by an unexpected interaction with turbopump cavitation. Later missions implemented anti-pogo modifications that had been under development. These included addition of a helium-gas reservoir to the center engine liquid oxygen line to damp pressure oscillations, an automatic cutoff as a backup, and simplification of the propellant valves of all five second-stage engines. Approaching 56 hours into the mission, Apollo 13 was approximately 205,000 miles (330,000 km) from Earth en route to the Moon. 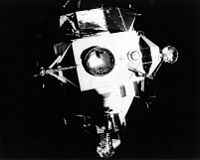 Approximately six and a half minutes after the end of a live TV broadcast from the spacecraft, Haise was in the process of closing out the LM, while Lovell was stowing the TV camera. Houston flight controllers asked Swigert to turn on the hydrogen and oxygen tank stirring fans in the service module, which were designed to destratify the cryogenic contents and increase the accuracy of their quantity readings. Two minutes later, the astronauts heard a "pretty large bang", accompanied by fluctuations in electrical power and the firing of the attitude control thrusters; the crew initially thought that a meteoroid might have struck the lunar module. Communications and telemetry to Earth were lost for 1.8 seconds, until the system automatically corrected by switching the high-gain S-band antenna, used for translunar communications, from narrow-beam to wide-beam mode. Swigert and Lovell reporting the incident on April 14, 1970 [2:59] "Houston, we've had a problem"
Immediately after the bang, Swigert reported a "problem", which Lovell repeated and clarified as a "main B bus undervolt", a temporary loss of operating voltage on the second of the spacecraft's main electrical circuits. Oxygen tank 2 immediately read quantity zero. About three minutes later, the number 1 and number 3 fuel cells failed. Lovell reported seeing out the window that the craft was venting "a gas of some sort" into space. The number 1 oxygen tank quantity gradually reduced to zero over the next 130 minutes, entirely depleting the SM's oxygen supply. Because the fuel cells generated the command and service module's electrical power by combining hydrogen and oxygen into water, when oxygen tank 1 ran dry, the remaining fuel cell finally shut down, leaving the craft on the command module's limited-duration battery power and water. The crew was forced to shut down the CM completely to save this for reentry, and to power up the LM to use as a "lifeboat". This situation had been suggested during an earlier training simulation, but had not been considered a likely scenario. Without the LM, the accident would certainly have been fatal. For these reasons, Kranz chose the alternative circumlunar option, using the Moon's gravity to return the ship to Earth. Apollo 13 had left its initial free-return trajectory earlier in the mission, as required for the lunar landing at Fra Mauro. Therefore, the first order of business was to re-establish the free-return trajectory with a 30.7-second burn of the DPS. 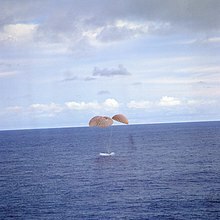 The descent engine was used again two hours after pericynthion, the closest approach to the Moon ("PC+2 burn"), to speed the return to Earth by 10 hours and move the landing spot from the Indian Ocean to the Pacific Ocean. A more aggressive burn could have been performed at PC+2 by first jettisoning the service module, returning the crew in about the same amount of time as a direct abort,p. III-20 but this was deemed unnecessary given the rates at which consumables were being used. The 4-minute, 24-second burn was so accurate that only two more small course corrections were subsequently needed. Availability of lithium hydroxide (LiOH) for removing carbon dioxide presented a serious problem. The LM's internal stock of LiOH canisters was not sufficient to support the crew until return, and the remainder was stored in the descent stage, out of reach. The CM had an adequate supply of canisters, but these were incompatible with the LM. 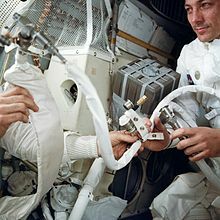 Engineers on the ground improvised a way to join the cube-shaped CM canisters to the LM's cylindrical canister-sockets by drawing air through them with a suit return hose. NASA engineers referred to the improvised device as "the mailbox". Another problem to be solved for a safe return was accomplishing a complete power-up from scratch of the completely shut-down command module, something never intended to be done in-flight. Flight controller John Aaron, with the support of grounded astronaut Mattingly and many engineers and designers, had to invent a new procedure to do this with the ship's limited power supply and time factor. This was further complicated by the fact that the reduced power levels in the LM caused internal temperatures to drop to as low as 4 °C (39 °F). The unpowered CM got so cold that water began to condense on solid surfaces, causing concern that this might short out electrical systems when it was reactivated. This turned out not to be a problem, partly because of the extensive electrical insulation improvements instituted after the Apollo 1 fire. The last problem to be solved was how to separate the lunar module a safe distance away from the command module just before reentry. The normal procedure was to use the service module's reaction control system (RCS) to pull the CSM away after releasing the LM along with the command module's docking ring, but this RCS was inoperative because of the power failure, and the useless SM would be released before the LM. To solve the problem, Grumman called on the engineering expertise of the University of Toronto. A team of six UT engineers, led by senior scientist Bernard Etkin, was formed to solve the problem within a day. The team concluded that pressurizing the tunnel connecting the lunar module to the command module just before separation would provide the force necessary to push the two modules a safe distance away from each other just prior to reentry. The team had 6 hours to compute the pressure required, using slide rules. They needed an accurate calculation, as too high a pressure might damage the hatch and its seal, causing the astronauts to burn up; too low a pressure would not provide enough separation distance of the LM. Grumman relayed their calculation to NASA, and from there in turn to the astronauts, who used it successfully. Odyssey regained radio contact and splashed down safely in the South Pacific Ocean, 21°38′24″S 165°21′42″W﻿ / ﻿21.64000°S 165.36167°W﻿ / -21.64000; -165.36167﻿ (Apollo 13 splashdown), southeast of American Samoa and 6.5 km (3.5 nmi) from the recovery ship, USS Iwo Jima. The crew was in good condition except for Haise, who was suffering from a serious urinary tract infection because of insufficient water intake. To avoid altering the trajectory of the spacecraft, the crew had been instructed to temporarily stop urine dumps, which forced them to invent ways of storing all urine for the rest of the flight. The lunar module and service module reentered the atmosphere over the South Pacific between the islands of Fiji and New Zealand. The board exhaustively investigated and analyzed the history of the manufacture and testing of the oxygen tank, and its installation and testing in the spacecraft up to the Apollo 13 launch, as documented in detailed records and logs. They visited and consulted with engineers at the contractor's sites and the Kennedy Space Center. Once a theory of the cause was developed, elements of it were tested, including on a test rig simulation in a vacuum chamber, with a damaged tank installed in the fuel cell bay. This test confirmed the theory when a similar explosion was created, which blew off the outer panel exactly as happened in the flight. Cortright sent the final Report of Apollo 13 Review Board to Thomas Paine on June 15, 1970. The failure started in the service module's number 2 oxygen tank. Damaged Teflon insulation on the wires to the stirring fan inside oxygen tank 2 allowed the wires to short-circuit and ignite this insulation. The resulting fire rapidly increased pressure beyond its 1,000-pound-per-square-inch (6.9 MPa) limit and the tank dome failed, filling the fuel cell bay (Sector 4) with rapidly expanding gaseous oxygen and combustion products. It is also possible some combustion occurred of the Mylar/Kapton thermal insulation material used to line the oxygen shelf compartment in this bay. Mechanical shock forced the oxygen valves closed on the number 1 and number 3 fuel cells, leaving them operating for only about three minutes on the oxygen in the feed lines. The shock also either partially ruptured a line from the number 1 oxygen tank, or caused its check or relief valve to leak, causing its contents to leak out into space over the next 130 minutes, entirely depleting the SM's oxygen supply. The oxygen shelf carrying the oxygen tanks was originally installed in the Apollo 10 service module, but was removed to fix a potential electromagnetic interference problem. During removal, the shelf was accidentally dropped about 2 inches (5 cm) because a retaining bolt had not been removed. The tank appeared to be undamaged, but a loosely fitting filling tube was apparently damaged, and photographs suggested that the close-out cap on the top of the tank may have hit the fuel cell shelf. The report of the Apollo 13 review board considers the probability of tank damage during this incident to be "rather low." After the tank was filled for ground testing, it could not be emptied through the normal drain line. To avoid delaying the mission by replacing the tank, the heater was connected to 65-volt ground power to boil off the oxygen. Lovell signed off on this procedure. It should have taken a few days at the thermostatic opening temperature of 27 °C (81 °F). When the thermostat opened, the 65-volt supply fused its contacts closed and the heater remained powered. The board confirmed by testing that the thermostats welded themselves closed under the higher voltage. This raised the temperature of the heater to an estimated 540 °C (1,000 °F). A chart recorder on the heater current showed that the heater was not cycling on and off, as it should have been if the thermostat was functioning correctly, but no one noticed it at the time. Because the temperature sensor was not designed to read higher than the 27 °C (81 °F) thermostat opening temperature, the monitoring equipment did not register the true temperature inside the tank. The gas boiled off in hours rather than days. This procedure was designed to prevent hardware failure so that the lunar landing mission could be continued. The Mission Operations Report Apollo 13 recounts how the master caution and warning alarm had been turned off for a previous low-pressure reading on hydrogen tank 2, and so it did not trigger to call attention to the high oxygen pressure reading. Oxygen tank 2 was not the only pressure vessel that failed during this mission. Prior to the accident, the crew had moved the scheduled entry into the lunar module forward by three hours. This was done to get an earlier look at the pressure reading of the supercritical helium (SHe) tank in the LM descent stage, which had been suspect since before launch. After the abort decision, the helium pressure continued to rise and Mission Control predicted the time that the burst disc would rupture. The helium tank burst disc ruptured at 108:54, after the lunar flyby. 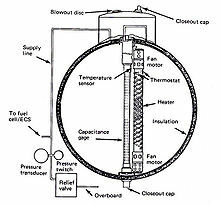 The expulsion reversed the direction of the passive thermal control (PTC) roll (nicknamed the "barbecue roll"). Because Apollo 13 followed the free-return trajectory, its altitude over the lunar far side was approximately 100 km (60 mi) greater than the orbital altitude on the remaining Apollo lunar missions. The Moon was almost at apogee during the mission (as it also was during the flights of Apollo 10 and Apollo 15), which also increased the distance from the Earth. The combination of the two effects ensures that Apollo 13 holds the absolute altitude record for a manned spacecraft, reaching a distance of 400,171 kilometers (248,655 mi) from Earth on 7:21 pm EST, April 14, 1970. The Apollo 13 mission was called a "successful failure" by Lovell, because of the successful safe return of the astronauts, but the failed lunar landing. It has also been termed "NASA's finest hour." President Nixon awarded the Presidential Medal of Freedom to the crew and the Apollo 13 Mission Operations Team for their actions during the mission. The Cold Cathode Gauge Experiment (CCGE) which was part of the ALSEP on Apollo 13 was never flown again. It was a version of the Cold Cathode Ion Gauge (CCIG) which featured on Apollo 12, Apollo 14, and Apollo 15. The CCGE was designed as a standalone version of the CCIG. On other missions, the CCIG was connected as part of the Suprathermal Ion Detector (SIDE). Because of the aborted landing, this experiment was never deployed. Other experiments included on Apollo 13's ALSEP included the Heat Flow Experiment (HFE), the Passive Seismic Experiment (PSE), and the Charged Particle Lunar Environment Experiment (CPLEE). 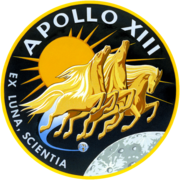 The Apollo 13 crew patch featured three flying horses as Apollo's "chariot" across space. Given Lovell's Navy background, the logo also included the mottoes "Ex Luna, scientia" ("From the Moon, knowledge"), borrowed from the U.S. Naval Academy's motto, "Ex scientia tridens" ("From knowledge, sea power"). The mission number appeared in Roman numerals as Apollo XIII. The patch did not have to be modified after Mattingly's replacement since it is one of only two Apollo mission insignia—the other being Apollo 11—not to include the names of the crew. It was designed by artist Lumen Martin Winter, who based it on a mural he had done for The St. Regis Hotel in New York City. The mural was later purchased by actor Tom Hanks, who portrayed Lovell in the movie Apollo 13, and now is on the wall of a restaurant near Chicago owned by Lovell's son. 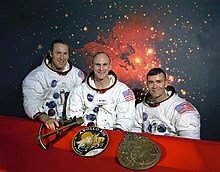 Despite Apollo 13's failure to land on the Moon, several experiments were conducted successfully because they were initiated before or conducted independently of the oxygen tank explosion. As a joke following Apollo 13's successful splashdown, Grumman Aerospace Corporation pilot Sam Greenberg (who had helped with the strategy for re-routing power from the LM to the crippled CM) issued a tongue-in-cheek invoice for $400,540.05 to North American Rockwell, Pratt and Whitney, and Beech Aircraft, prime and subcontractors for the CSM, for "towing" the crippled ship most of the way to the Moon and back. The figure was based on an estimated 400,001 miles (643,739 km) at $1.00 per mile, plus $4.00 for the first mile. An extra $536.05 was included for battery charging, oxygen, and an "additional guest in room" (Swigert). A 20% "commercial discount," as well as a further 2% discount if North American were to pay in cash, reduced the total to $312,421.24. North American declined payment, noting that it had ferried three previous Grumman LMs to the Moon (Apollo 10, Apollo 11 and Apollo 12) with no such reciprocal charges. The lunar module burned up in Earth's atmosphere on April 17, 1970, having been targeted to enter over the Pacific Ocean to reduce the possibility of contamination from a SNAP 27 radioisotope thermoelectric generator (RTG) on board. Intended to power the mission's ALSEP, the RTG survived reentry (as designed) and landed in the Tonga Trench. While it will remain radioactive for several thousand years, it does not appear to be releasing any of its 3.9 kg of radioactive plutonium-238. Lovell's lunar space suit helmet, one of his gloves, and the plaque that had been intended to be left on the Moon are on exhibit at the Adler Planetarium in Chicago, Illinois. The 1974 movie Houston, We've Got a Problem, while set around the Apollo 13 incident, is a fictional drama about the crises faced by ground personnel when the emergency disrupts their work schedules and places additional stress on their lives; only a couple of news clips and a narrator's solemn voice deal with the actual problems. "Houston... We've Got a Problem" was also the title of an episode of the BBC documentary series A Life At Stake, broadcast in March 1978. This was an accurate, if simplified, reconstruction of the events. The next year, in 1995, a film adaptation of the book, Apollo 13, was released, directed by Ron Howard and starring Tom Hanks as Lovell, Bill Paxton as Haise, Kevin Bacon as Swigert, Gary Sinise as Mattingly, Ed Harris as flight director Gene Kranz, and Kathleen Quinlan as Marilyn Lovell. James Lovell, Eugene Kranz, and other principals have stated that this film depicted the events of the mission with reasonable accuracy, given that some dramatic license was taken. 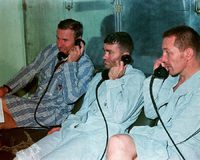 For example, the film changes the tense of Lovell's famous follow-up to Swigert's original words from, "Houston, we've had a problem", to "Houston, we have a problem". The film was nominated for several Academy Awards, including Best Picture, Best Supporting Actor (Harris) and Best Supporting Actress (Quinlan). In 2008, an interactive theatrical show titled Apollo 13: Mission Control premiered at BATS Theatre in Wellington, New Zealand. 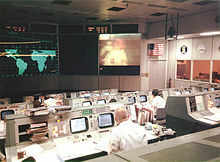 The production faithfully recreated the mission control consoles and audience members became part of the storyline. The show also featured a 'guest' astronaut each night: a member of the public who suited up and amongst other duties, stirred the oxygen tanks and said the line "Houston, we've had a problem." This 'replacement' astronaut was a nod to Jack Swigert, who replaced Ken Mattingly shortly before the launch in 1970. The production toured to other cities extensively in New Zealand and Australia in 2010–2011. The production was scheduled to travel to the US in 2012. In the DC's Legends of Tomorrow episode 'Moonshot,' the oxygen tank explosion is averted when Eobard Thawne disguises himself as Swigert, in order to retrieve a piece of the Spear of Destiny that was hidden in the pole section of the American flag planted on July 21, 1969. Thawne and Ray Palmer crash land the lander on the Moon's surface. In November 2011, a notebook containing a checklist Lovell used to calculate a trajectory to get the damaged spacecraft, Apollo 13, back to Earth, and handwritten calculations by Lovell, was auctioned off by Heritage Auctions for $388,375. NASA made an email inquiry asking Heritage if Lovell had clear title to the notebook, stating that NASA had "nothing to indicate" the agency had ever transferred ownership of the checklist to Lovell. In January 2012, Heritage stated that the sale had been placed on hold after NASA launched an investigation into whether it was the astronaut's property to sell. ^ "Lumen Martin Winter – Kansapedia – Kansas Historical Society". www.kshs.org. Retrieved 2018-02-02. 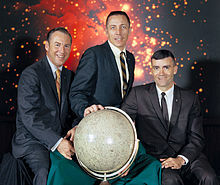 ^ "Bernard Etkin helped avert Apollo 13 tragedy". The Globe and Mail. Retrieved 23 July 2014. ^ Lovell, James A. (1975). "Tired, Hungry, Wet, Cold, Dehydrated". In Cortright, Edgar M. Apollo Expeditions to the Moon. Washington, D.C.: NASA. NASA SP-350. Retrieved July 4, 2013. ^ Cortright, Edgar M. (June 15, 1970). "Report of Apollo 13 Review Board" (PDF). Washington, D.C.: NASA. Text (.TXT) file of report here. Multi-part PDF files of the report are available here Archived June 6, 2013, at the Wayback Machine and here Archived May 18, 2013, at the Wayback Machine. NASA's official report does not use the word "explosion" in describing the tank rupture. See findings 26 and 27 Archived October 15, 2012, at the Wayback Machine (PDF) on page 195 (5-22) of the NASA report. ^ Lovell, James A. (1975). "'Houston, We've Had a Problem'". In Cortright, Edgar M. Apollo Expeditions to the Moon. Washington, D.C.: NASA. NASA SP-350. Retrieved July 4, 2013. ^ "Steeds Of Apollo". Lovell's of Lake Forest (Steakhouse). Lake Forest, IL. Archived from the original on January 22, 2012. Retrieved January 19, 2012. ^ ""A Life at Stake" Houston... We've Got a Problem (TV Episode 1978) - IMDb". Internet Movie Database. Retrieved 14 February 2015.